Working with a Staffing Agency is a great way to find the top-quality talent your company needs to stay ahead of the game in an increasingly competitive business landscape. As you know, this can be a time intensive process. Working with a partner allows you to focus on your core business and be confident you are gaining access to the best available candidates. Are you looking for 1-2 additional employees a year or are you looking to continue staffing large projects that on average need 4-5+ employees quarterly? This question will help you determine what size staffing agency you need to work with. You need to make sure that the staffing agency has the capabilities to provide you with the amount and variety of talent you need. This means the agency should have a deep talent pool of vetted, highly-qualified individuals that they can source from. This seems pretty straightforward, but it is an important consideration nonetheless. 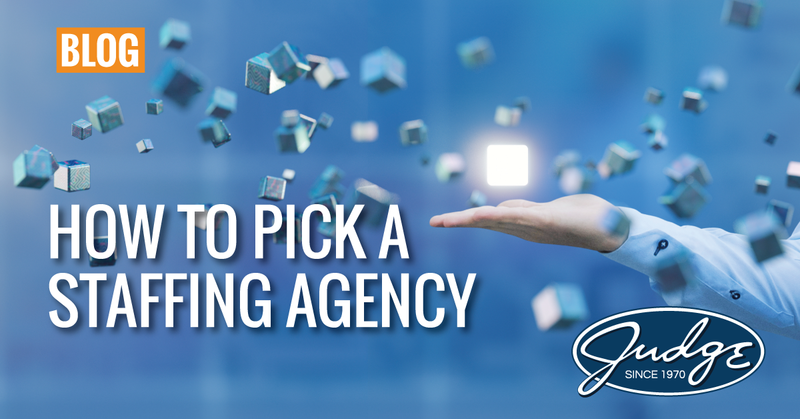 Make sure the agency you decide to work with has expertise in the industry you operate in. Does the staffing agency employ recruiters who understand the specific needs, and possible regulations, of your industry? This goes a long way in finding quality candidates with the right experience who will help your company grow and innovate. Can this agency walk a contractor into their first day of work in Seattle, while in Boston they’re sending in the leading candidate for your open CFO position? A staffing agency with a national footprint will be better equipped to source talent from across the country and have a better understanding of how business is conducted in specific regions. Does the Staffing Agency take cybersecurity seriously? Look for an agency that has a security certification to show that they won’t be careless with sensitive data. Something like the HITRUST certification shows that the agency passed a rigorous evaluation and their systems are designed and verified to protect the personal information of your company and your contractors. Does your Staffing Agency offer other services apart from only staffing? Some agencies offer additional services beyond their workforce augmentation solutions. Some may offer training services to bring your staff up to speed on new technology or processes you’re putting in-place, or they might offer you solutions to managing your data center & data security. The ability to leverage your relationship with one firm for a variety of services can benefit your organization. Does the Staffing Agency offer their contractors benefits? This is an often-overlooked question and you may be wondering if this is important. But this has to do with the quality of contractor you are receiving from the agency. Contractors are like employees: they will factor in benefits when considering a job offer. The best talent is going to go where the best all-around option is. This means you’re more likely to get a higher-quality candidate from a staffing agency with benefits than from one that doesn’t. Make sure the staffing agency you’re considering treats their contractors right. There are a lot of factors to look at when you are considering working with a staffing agency. It is important to make sure you have a true partner that understands the industry, has a network of available talent, understands your company, and can provide candidates who match your corporate culture as well as the necessary skill sets. When you find the right agency, not only do you get the right talent but you will be amazed at how easy the process can be when you have a true partner.